Yay, it`s my first Fall recipe for the season! It`s an easy-peesy recipe, too. Because sometimes (almost always for me) I just want to eat something super awesome without having to spend over 2 hours making it. Common recipes considered to be simple, such as cookies, brownies, muffins, quick breads, and etc, are seen as those go-to recipes. They`re usually straight-forward and hassle-free. (Unless, that is, you`re not making them complicated...like roasting strawberries or browning butter...) It doesn`t take much to whisk together dry and wet ingredients and combine them both. Yet, when you include the baking time (quick breads take an hour sometimes! ), washing the dishes, and randomly cleaning up afterwards, it takes me at least 2-3 hours! I`m not blessed to have a nice kitchen with multiple ovens to bake a few batches at once. Haha. I don`t even have a window oven. Yeah, I feel sad for me, too. To ensure all my cookies come out perfect, I bake 1 batch at a time. Hence, it takes me about 2 hours from start to finish! Is this just me?!?! D: Am I the only one that`s always doubting those "total" baking times?! Well,...this recipe is sort of like those recipes. Kind of. Haha! 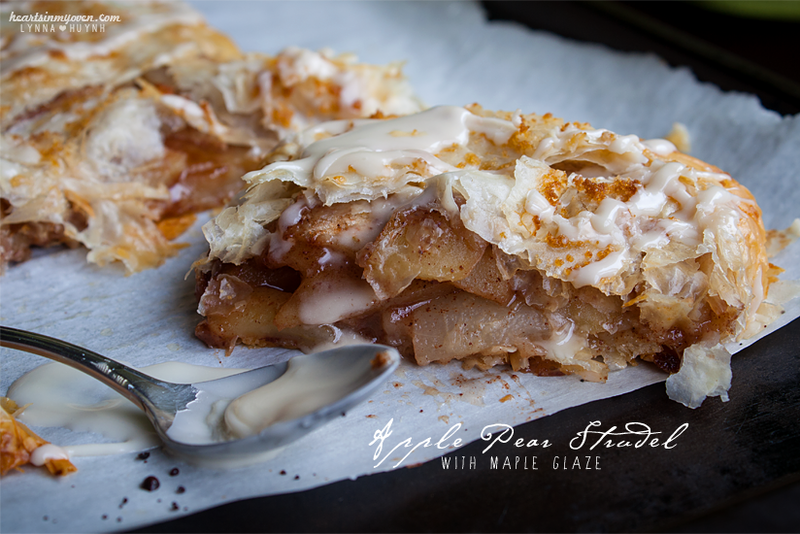 It`s really easy because you need frozen phyllo dough. But, I promise, once you take a bite into this flaky awesomeness right here, you won`t mind the frozen prep item. 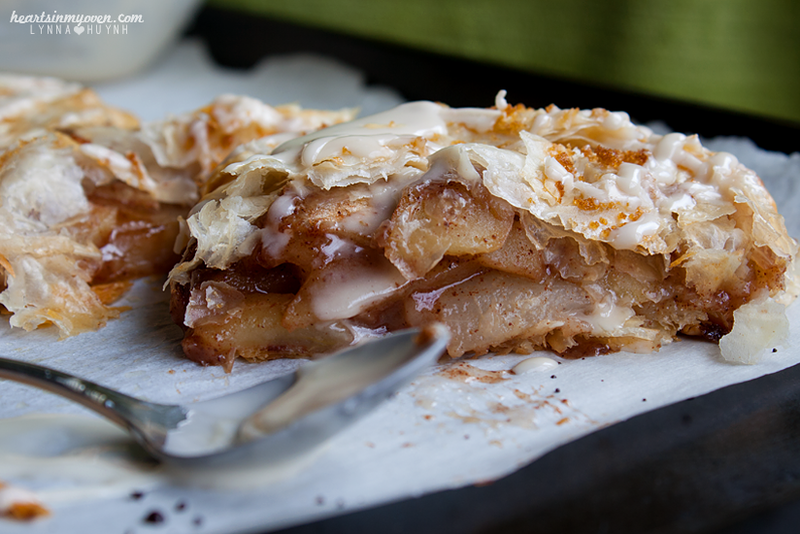 You melt some butter, spread on each phyllo sheet, toss apples in some sugar, spread on phyllo, wrap, bake, and EAT! Ta-daaa~ Easy! 2. In a medium-large bowl, combine sugar, flour, cinnamon, and allspice. 3. 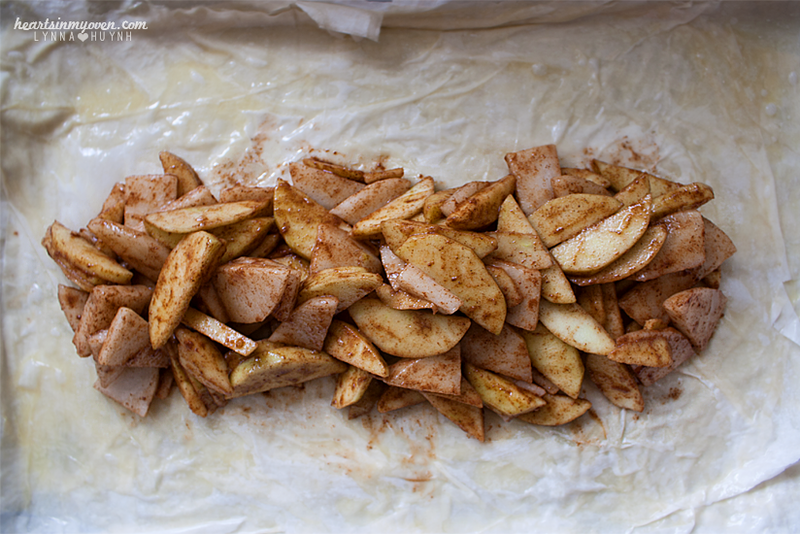 Toss apple slices, pear slices, and vanilla into bowl to fully coat. Set aside. 4. On a large piece of parchment paper, place 1 sheet of phyllo dough on top. 6. Place another phyllo dough sheet on top and brush with butter. Repeat until you've used 8 sheets. 7. Scoop apple-pear mixture into the center of phyllo sheet. Form into a long rectangle, matching the phyllo dough's dimensions. Leave 2 inches on each side. 8. Wrap the short sides of phyllo dough first, then roll up, lengthwise into a wrap. Place seam side down. 9. Transfer parchment paper, with strudel, onto your baking sheet. 10. Brush top with melted butter. 11. Bake for 35-40 minutes, or top is golden brown. 13. 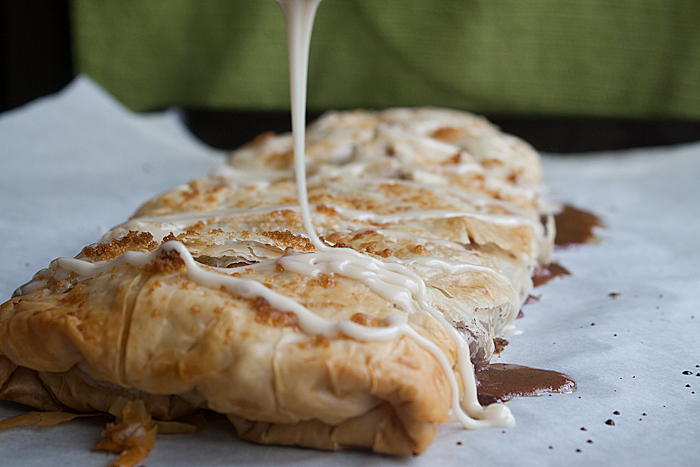 Drizzle on top of warm strudel.